Since 1st June 2013, a European Consumer Protection Act (EC Directive 2002/91 / EC) is also applicable in Spain under Royal Decree RD 235/2013, according to which every property sold or rented must have an energy certificate. Contrary to popular belief that the energy certificate for a Mallorca property needs to be available only on notarisation of a purchase contract or conclusion of a lease, this is not the case. It should be available when the property is advertised for sale or for rent. Failure to comply with this rule may result in a severe fine. Both private individuals and real estate agents on Mallorca are obliged to indicate the determined energy rating in advertisements. The energy certificate is issued by authorised engineers or architects after prior inspection of the property (insulation, heating, lighting, ventilation, etc.) and recorded in a register and is valid for 10 years from the date of issue. The energy certificate is a kind of seal of quality: it should encourage builders and sellers to build energy-conscious properties and also to encourage owners to consider energy efficiency. If energy saving measures are taken during the period of ownership and whilst the certificate is still valid, then the owner should obtain a new certificate with the then improved energy rating. 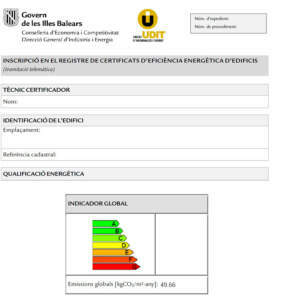 The energy certificate also contains recommendations on how to improve the energy efficiency of the property, but a bad energy rating does not impose any building code requirements and, more important, does not oblige the owner to undertake any energy-efficient conversation measures. Minkner & Partner, your real estate agent on Mallorca, has a network of experienced engineers and architects who are authorised to issue energy certificates. with CIF: B07748213 and registered office at Avenida JAIME I 109, 07180 SANTA PONSA (ILLES BALEARS), Spain, with the purpose of attending your enquiries, providing information regarding the real estate market and the organization of related events. In compliance with current regulations, MINKNER & PARTNER PROFI KONZEPT SLU informs that the data will be kept for the legally established period. Unless you tell us otherwise, we understand that your data has not been modified, that you agree to notify us of any change and that we have your consent to use it for the purposes mentioned. In turn, we inform you that you can contact the Data Protection Delegate of MINKNER & PARTNER PROFI KONZEPT SLU, by writing to them at the e-mail address dpo.cliente@conversia.es or by phone on 902 877 192.
undertakes to adopt all reasonable measures so that these are deleted or rectified without delay when they are inaccurate. as well as the consent given for the treatment of such, directing your request to the postal address indicated above or to the email address PRIVACY@MINKNER.COM. You can contact the competent Control Authority to present the claim that you deem appropriate.